in a world where digital has official conquered all, i find myself really attracted to just about anything analog. i know, i know, i am sitting here typing on my computer in a room filled with electronic gadgets i would give my little toe to keep, and at the same time griping about them all. what can i say? but for the past few months i have been dreaming of owning a typewriter, and typing letters (that are then sent with actual stamps) to friends, family and perhaps even strangers. this one from mytypewriter.com would fit perfectly right in the center of my desk ... and then maybe i could use it for our guest book at the wedding? sorry east side, i will start using the next size up font. i just love small ... thanks for the heads up. it is pretty. but i'm squinting! christine, this is Megan. 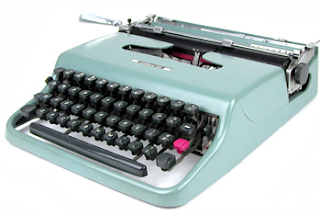 My typewriter I was telling you about today sort of looks like this one. You just need to find a really cool old woman who would want you to inherit their precious typewriter.